PUEBLO - Barbara and the late Tony Fortino, and Team Tundra (Mark and Carol Rickman and ThunderWolf mascot Tundra), will be honored as part of the 2016 President's Gala on Saturday, May 14 in the Occhiato University Center (OUC) Ballroom, the last gala before the facilities' major expansion and renovation. Proceeds from the Gala directly benefit future generations of CSU-Pueblo students through scholarships and programs. President's Medallions for Distinguished Service will be presented to Barbara and the late Tony Fortino and Team Tundra at the 2016 President's Gala, which will begin at 6 p.m. with cocktails in the Hearthwell Lounge. Tickets for the 2016 President's Gala are $125 per person or $1,500 for a corporate table of 8. Information on tickets, sponsorships, and corporate tables is available through the CSU-Pueblo Foundation, 719.549.2380 or at www.csupueblogala.com. As part of the evening, faculty pianist Zahari Metchkov will be featured with CSU-Pueblo faculty and students in a dueling musical performance of two pianos, plus a percussionist and a bass player. For the fourth straight year through the generosity of 2001 alumnus Chris Turner, a reunion of former Associated Students Government presidents and vice presidents will begin at 5 p.m. on the evening of the gala. Contact Director of Alumni Relations Tracy Samora for more information at 719.549.2858 or tracy.samora@csupueblo.edu. The President's Medallions recognize individuals who set high standards of ethics and values to serve as examples for CSU-Pueblo students and the campus community as a whole through their profession, exceptional service, and/or contributions to humanity. Recipients support the University's continual progress toward future goals and achievements and/or make significant contributions as an advocate of post secondary education. Barbara and the late Tony Fortino will receive the medallion for Distinguished Service to the Community for their diverse contributions to Pueblo charities and non-profit organizations. A World War II veteran, Tony returned from war to work in his father's grocery store before opening his first used car lot. He then partnered with Bob Jackson for 40 years before selling their Fortino Jackson Chevrolet dealership. Tony was the first chairman of Pueblo Crime Stoppers as well as chairman of the Airport Advisory Board. He was a long-time member of the Greater Pueblo Chamber of Commerce, serving as President in 1988. For 20 years he served as president of the non-profit organization, the Pueblo Development Foundation, which was instrumental in building the complexes for the Pueblo Industrial Park. He also served the Planning and Zoning commission for 12 years, and the Pueblo Economic Development Corporation for more than 18 years. He co-founded the Pueblo Community College Foundation with then president Tony Zeiss, and served as its president from inception through 2006. Governor Lamm appointed Tony to the Colorado State Highway Commission and the Colorado Supreme Court Nominating Committee, where he served for 20 and six years, respectively. Barbara taught high school language arts in Pueblo District 60 for more than 35 years. Upon retirement, she served on the Sangre de Cristo Arts Center Board and Southern Colorado Community Foundation Board. Since 2002, she has been a member of the CSU-Pueblo President's Leadership Program (PLP) advisory board. She was a founding member of the Colorado State Fair Ladies, chairs the scholarship committee for the Pueblo Community College Foundation Board, and serves on the Broadway Theatre League board. The couple sponsor three scholarships, one for a CSU-Pueblo PLP student, one at Pueblo Community College, and one for the Pueblo's Sons of Italy Lodge. 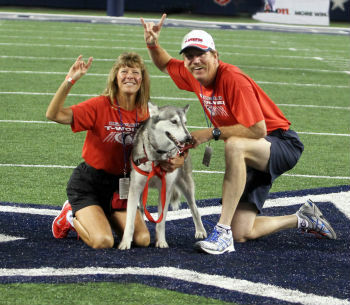 Mark and Carol Rickman and their dog, Tundra the ThunderWolf mascot, will receive a medallion for Distinguished Service to the University for the hundreds of hours they have donated and the many events they have attended as perhaps the University's greatest fans. Since 2009, Mark and Carol have made a personal commitment to attend at least one athletic event for all of CSU-Pueblo's 22 intercollegiate teams because they want all CSU-Pueblo athletes to feel supported and appreciated. This commitment is in addition to NEVER missing a home football game since 2009. Mark and Tundra lead out the football team at every home contest. In addition to their athletics loyalty, they also serve as ambassadors for the campus at a variety of recruitment events, community parades, advertising/photo shoots, and visits to elementary schools. The Rickmans have never asked for anything in return for their participation; they do it because they LOVE being a part of CSU-Pueblo. The Rickmans also are generous donors to athletics, the general scholarship fund, and the Alumni Association, including a recent gift to the On the Move campaign to benefit the enhanced Art and Lorraine Gonzales Soccer/Lacrosse Stadium and the OUC renovation. A 1983 biology alumna, Carol currently serves as Vice-President of the Alumni Board and will become Board President on July 1.